The Account Center contains a powerful and easy-to-use tool to create redirects for your Grid hosted domains. This simple tool allows you to create a 301 redirect command and writes it to the .htaccess file on your Grid. You can learn more here. Watch this video to learn how to use the Redirect Domains tool. From the Overview page of your Account Center, click on the Admin button to the right of your Grid service. You can also select the primary domain of your Grid from the Domains menu. 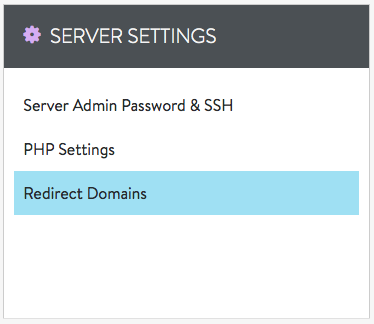 Select Redirect Domains from the Server Settings menu of your Grid Control Panel. On this screen, enter the FULL URL in the Redirect to: field to the right of the desired domain or subdomain. Click the Save Changes button to save your redirect. Plesk makes it very easy to create domain aliases. You have the option to automatically create SEO friendly 301 redirects that write to the .htaccess file. These instructions are for the service provider view of Plesk 12.5. If you are on an earlier version of Plesk, the locations of menus may be in a slightly different place. For help upgrading to the latest version of Plesk, please refer to this article. 1. Log into the Plesk control panel and select Domains from the menu on the left. 2. Select Add Domain Alias from the grey menu bar. 3. Now type in the address that you would like to redirect from and select the domain you'd like to redirect to. If you would only like to redirect the website of this domain and not any other associated services such as mail, only select the Redirect with the HTTP 301 code option. For help redirecting to external sites, please see our DV redirect guide. It has instructions for creating a simple redirect in the .htacess.